"When I look back on my childhood I wonder how I managed to survive at all. It was, of course, a miserable childhood: the happy childhood is hardly worth your while. Worse than the ordinary miserable childhood is the miserable Irish childhood, and worse yet is the miserable Irish Catholic childhood." So begins the luminous memoir of Frank McCourt, born in Depression-era Brooklyn to recent Irish immigrants and raised in the slums of Limerick, Ireland. Frank's mother, Angela, has no money to feed the children since Frank's father, Malachy, rarely works, and when he does he drinks his wages. Yet Malachy does nurture in Frank an appetite for the one thing he can provide: a story. Michiko Kakutani "The New York Times" The reader of this stunning memoir can only hope that Mr. McCourt will set down the story of his subsequent adventures in America in another book. "Angela's Ashes" is so good it deserves a sequel. Malcom Jones, Jr. "Newsweek" It is only the best storyteller who can so beguile his readers that he leaves them wanting more when he's done. With "Angela's Ashes, " McCourt proves himself one of the very best. 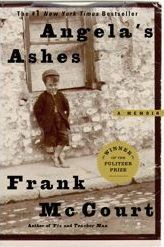 Frank McCourt (1930-2009) was born in Brooklyn, New York, to Irish immigrant parents, grew up in Limerick, Ireland, and returned to America in 1949. For thirty years he taught in New York City high schools. His first book, Angela's Ashes, won the Pulitzer Prize, the National Book Critics Circle Award and the L.A. Times Book Award. In 2006, he won the prestigious Ellis Island Family Heritage Award for Exemplary Service in the Field of the Arts and the United Federation of Teachers John Dewey Award for Excellence in Education. Frank McCourt (1930-2009) was born in Brooklyn, New York, to Irish immigrant parents, grew up in Limerick, Ireland, and returned to America in 1949. For thirty years he taught in New York City high schools. His first book, Angela's Ashes, won the Pulitzer Prize, the National Book Critics Circle Award and the L.A. Times Book Award. In 2006, he won the prestigious Ellis Island Family Heritage Award for Exemplary Service in the Field of the Arts and the United Federation of Teachers John Dewey Award for Excellence in Education.